PASSIVE - Your Physical Damage ignores 15% of the target's Physical Protection. If the target has over 65 Physical Protections, this effect scales up to ignore a larger percentage of their protection. This caps at 40% Physical Penetration at 200 or more Physical Protection. As of Patch 5.9, passive ignores a minimum 15% of target's physical protection, up to 65 protection. The effect scales up to max 40% linearly at 200 physical protections. Here's a chart showing the progression. Note that this just gives you the % pen calc. You then have to use that value as a percentage (a value of 23% would be 0.23) and multiply that by the enemy's protections to get the flat pen value. For squishies building 0 protections at level 20, you will usually get only around the minimum 15% pen. This is only around 10 penetration, making flat pen items like Brawler's Beat Stick and The Crusher superior in effect. It is also unlikely that all but perhaps 1 enemy in a balanced match will ever reach 200+ physical protection. That said, if an enemy gets even one normal physical protection item and their protection exceeds 100 at level 20, you'll get more pen out of TB than you would any flat pen item. 128379 Branmuffin17 As of Patch 5.9, passive ignores a minimum 15% of target's physical protection, up to 65 protection. The effect scales up to max 40% linearly at 200 physical protections. In case you want to find out exactly how much pen you're getting out of this item against an opponent with a specific amount of physical prots, here's the calculation: [indent][color=#ff0000](((Prots - 65) / 135) * 25) + 15[/color][/indent] Here's a chart showing the progression. 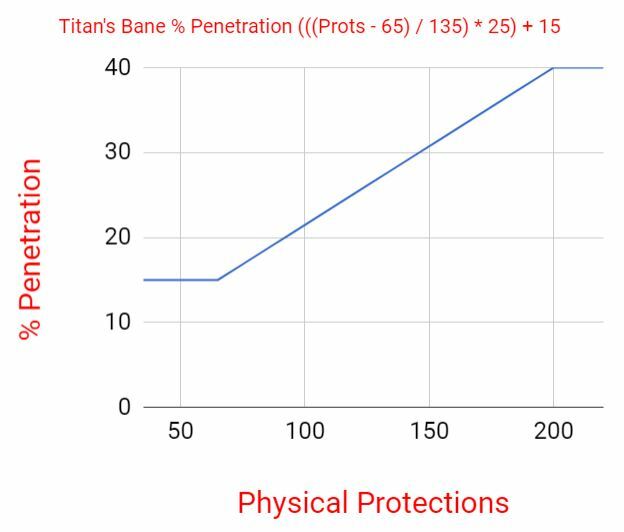 [img]https://s31.postimg.cc/3pnu6kza3/Titan_s_Bane_Pen_Calc_Patch_5.9.jpg[/img] Note that this just gives you the % pen calc. You then have to use that value as a percentage (a value of 23% would be 0.23) and multiply that by the enemy's protections to get the flat pen value. For squishies building 0 protections at level 20, you will usually get only around the minimum 15% pen. This is only around 10 penetration, making flat pen items like [[Brawler's Beat Stick]] and [[The Crusher]] superior in effect. It is also unlikely that all but perhaps 1 enemy in a balanced match will ever reach 200+ physical protection. That said, if an enemy gets even one normal physical protection item and their protection exceeds 100 at level 20, you'll get more pen out of TB than you would any flat pen item. So against enemies that didn't build too many high physical protection items, could an item like Bloodforge be more useful for dps? 128381 Kriega1 So against enemies that didn't build too many high physical protection items, could an item like [[Bloodforge]] be more useful for dps? It's not an easy, straightforward answer. Let's make some assumptions. % pen is almost always more of a late game item (except The Executioner, which DPS hunters usually want earlier)...we're not considering TB early in a build. The enemy is a squishy, and most gods at level 20 have at least 60 protections. We're not talking about combining Exe + TB. God we're building is an ability-based Assassin or something. Average item in a full build when a squishy wants physical protections will usually be at least 40. (obvious exceptions are things like Magi's Cloak. So, if a squishy gets an item specifically for the protection, they're likely to hit at least 100 protections. As you can see from the chart, at 100, % pen exceeds 20%, which means 20 flat pen or higher, which is higher than any item containing flat pen (with the exception of stacking protection reduction from Stone Cutting Sword. So the ROI on TB should be pretty good IF the enemy gets protections. Then you have to consider how much actual pen you have in other items. The closer you get to true damage, the more the damage ramps up. Individual god has to be considered too, because some scale VERY well with power, while others are only mediocre. Against a squishy with no added protections, and if you have a couple decent flat pen items ( Heartseeker + Brawler's Beat Stick + Jotunn's Wrath, say, then maybe Bloodforge would have better damage potential, especially for a high scaling ability. I'd guess it's very similar damage output overall, though. Bloodforge is a bit situational though. For consistent output against all enemies, TB still seems like it should be okay. To get the most out of BF, you need to get kills (for the shield), and/or you need to basic attack a decent amount (to get the lifesteal). If you're just going for the power, then you might be better off with a similar power item that has different benefit (e.g. Shifter's Shield). 128384 Branmuffin17 It's not an easy, straightforward answer. Let's make some assumptions. [list=1][*]% pen is almost always more of a late game item (except [[The Executioner]], which DPS hunters usually want earlier)...we're not considering TB early in a build. [*]The enemy is a squishy, and most gods at level 20 have at least 60 protections. [*]We're not talking about combining Exe + TB. [*]God we're building is an ability-based Assassin or something. [*]Average item in a full build when a squishy wants physical protections will usually be at least 40. (obvious exceptions are things like [[Magi's Cloak]]. [/list] So, if a squishy gets an item specifically for the protection, they're likely to hit at least 100 protections. As you can see from the chart, at 100, % pen exceeds 20%, which means 20 flat pen or higher, which is higher than any item containing flat pen (with the exception of stacking protection reduction from [[Stone Cutting Sword]]. So the ROI on TB should be pretty good IF the enemy gets protections. Then you have to consider how much actual pen you have in other items. The closer you get to true damage, the more the damage ramps up. Individual god has to be considered too, because some scale VERY well with power, while others are only mediocre. Against a squishy with no added protections, and if you have a couple decent flat pen items ([[Heartseeker]] + [[Brawler's Beat Stick]] + [[Jotunn's Wrath]], say, then maybe [[Bloodforge]] would have better damage potential, especially for a high scaling ability. I'd guess it's very similar damage output overall, though. [[Bloodforge]] is a bit situational though. For consistent output against all enemies, TB still seems like it should be okay. To get the most out of BF, you need to get kills (for the shield), and/or you need to basic attack a decent amount (to get the lifesteal). If you're just going for the power, then you might be better off with a similar power item that has different benefit (e.g. [[Shifter's Shield]]). So Shifter's Shield, Bloodforge and Transcendence (if not picked up earlier), all can be used in place of Titan's Bane if the enemy tanks didn't build too high physical defense? 128386 Kriega1 So [[Shifter's Shield]], [[Bloodforge]] and [[Transcendence]] (if not picked up earlier), all can be used in place of [[Titan's Bane]] if the enemy tanks didn't build too high physical defense? If considering any reasonable amount of damage against a tank as an ability user, I'd say TB is still important. Also, consider when you pick the items up. Trans is gotten early. You'd plan for it early. If facing mostly squishies, I see BF and SS being late possibilities if you've gotten enough flat pen. TB sorta is weak against 65 prots. All depends. 128388 Branmuffin17 If considering any reasonable amount of damage against a tank as an ability user, I'd say TB is still important. Also, consider when you pick the items up. Trans is gotten early. You'd plan for it early. If facing mostly squishies, I see BF and SS being late possibilities if you've gotten enough flat pen. TB sorta is weak against 65 prots. All depends. So I've been working on my Izanami build (in preparation for writing up my guide) and I was stuck on which would be better for her considering the nature of her normals, The Executioner or Titan's Bane. 128390 SkyPirateShini So I've been working on my [[Izanami]] build (in preparation for writing up my guide) and I was stuck on which would be better for her considering the nature of her normals, [[The Executioner]] or [[Titan's Bane]]. I've seen people debate this back on Smite reddit with some conflicting reports. Apparently her regular autos only apply the first stack of The Executioner but this may be false and may have to be tested in game. However, I do know for sure that her passive works better with Titan's Bane. 128393 Kriega1 I've seen people debate this back on Smite reddit with some conflicting reports. Apparently her regular autos only apply the first stack of [[The Executioner]] but this may be false and may have to be tested in game. However, I do know for sure that her passive works better with [[Titan's Bane]]. Yeah, Reddit is what made me start rethinking building The Executioner on her. I might try a bot match and see if I can tell a difference. And I've never been sure if she apply on hit effects like The Executioner on her return strokes. I know she can crit on both parts of her basics but not sure if on hit effects work the same way. 128394 SkyPirateShini Yeah, Reddit is what made me start rethinking building [[The Executioner]] on her. I might try a bot match and see if I can tell a difference. And I've never been sure if she apply on hit effects like [[The Executioner]] on her return strokes. I know she can crit on both parts of her basics but not sure if on hit effects work the same way. Easiest way to test would be in Jungle Practice with a friend. Check each hit's damage, and make sure the return also hits. If damage increases each time in 3 actual basics, then the return doesn't also stack. If it only increases the 2nd basic, then you know the return does stack. I remember reading this too. And DB is another item I've heard doesn't actually work very well...suggested if you go the crit route has historically been Malice, but that was before the major passive change. 128395 Branmuffin17 Easiest way to test would be in Jungle Practice with a friend. Check each hit's damage, and make sure the return also hits. If damage increases each time in 3 actual basics, then the return doesn't also stack. If it only increases the 2nd basic, then you know the return does stack. I remember reading this too. And DB is another item I've heard doesn't actually work very well...suggested if you go the crit route has historically been [[Malice]], but that was before the major passive change. Kriega, flat pen is the way to go for DPS against a squishy on ability based gods. I tested this a long time ago. I compared damage numbers on an Odin build using Transcendence vs. Brawler's Beat Stick. His damage numbers were in the same ballpark using bird bomb. But understand something: to counter flat pen, you literally just need to build ANY physical protection item. This is where Titan's Bane is useful. In my opinion, Titan's Bane is in a bad place right now. You should never build it together with The Executioner (in your hunter builds). You'd honestly have much better DPS with a different item. Finally, we're friends on PS4. If you catch me online, just IM me, and I'll gladly join you for some jungle practice where we can test some stuff out. I have a mic. 128387 boogiebass Kriega, flat pen is the way to go for DPS against a squishy on ability based gods. I tested this a long time ago. I compared damage numbers on an [[odin]] build using [[transcendence]] vs. [[brawler's beat stick]]. His damage numbers were in the same ballpark using bird bomb. But understand something: to counter flat pen, you literally just need to build ANY physical protection item. This is where [[titan's bane]] is useful. In my opinion, [[titan's bane]] is in a bad place right now. You should never build it together with [[the executioner]] (in your hunter builds). You'd honestly have much better DPS with a different item. Finally, we're friends on PS4. If you catch me online, just IM me, and I'll gladly join you for some jungle practice where we can test some stuff out. I have a mic. Thanks but im currently on a break from Smite. Will be playing it again around early July, and may or may not play on PS4 or PC instead depending on circumstances (or both). 128391 Kriega1 Thanks but im currently on a break from Smite. Will be playing it again around early July, and may or may not play on PS4 or PC instead depending on circumstances (or both). Don't do it, Kriega. Stay away from Boogie. He's bad news. 128389 Branmuffin17 Don't do it, Kriega. Stay away from Boogie. He's bad news. 128396 boogiebass LOL. Explain yourself Bran! Don't listen to Bernie, he doesn't know what he's talking about.